On a mandolin, or with a food processor, julienne the zucchini or squash and place in a colander. You can also use a “curly fry” attachment for creating spirals for more interest. Add a few dashes of sea salt to the vegetables and toss to coat. Allow to sit in the sink for about 20 minutes. This will help some of the excess water drain out from the zucchini. 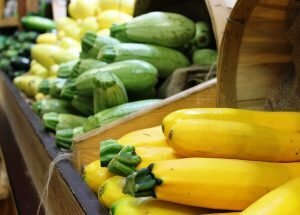 After the 20 minutes are up, place the zucchini in some paper towels and squeeze gently to remove any remaining moisture. This will make it more pasta-like. 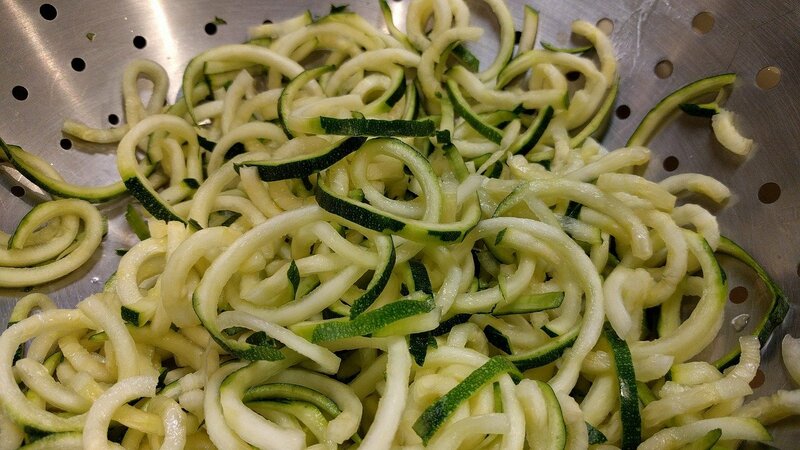 To eat plain, heat the coconut oil in a skillet, toss the zucchini in the oil for 2 minutes, add sea salt to taste. Serve with ghee and roasted garlic pieces. Variation: Serve with any of the pasta sauces, toss for 2-3 minutes in the hot pan. Serve immediately. Note: It is best to eat with the peel. If you are intending to use the pasta in a hot dish, you may wish to peel the zucchini first. The green skin will add a flavor that may not match your sauce. If you are intending to use the pasta in a cold dish, peeling is optional depending on the flavors of the mixed ingredients.